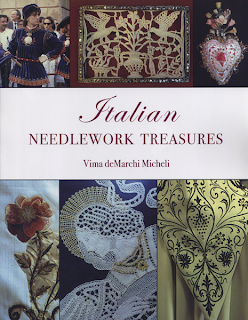 It is with great excitement that I tell you – Vima deMarchi Micheli's latest book, Italian Needlework Treasures is now available! I have been anticipating this publication for as long as I've known Vima. Her experience in the world of Italian needlework is amazing. She has been studying and traveling in Italy for many – many years and now we can benefit by reading of her adventures and admiring the beautiful Italian Needlework Treasures which she has seen and learned about. 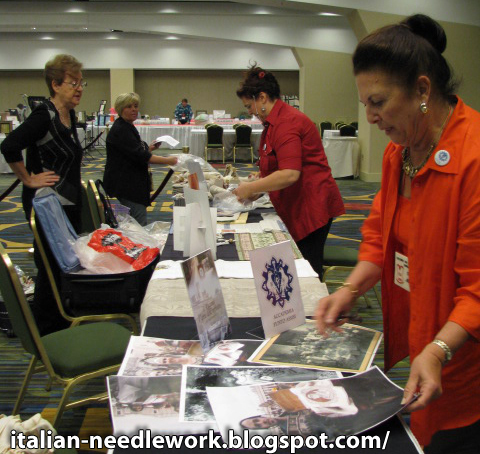 Italian Needlework Treasures is everything I hoped it would be. It starts out with a chapter on the history of embroidery with attention to Italian-related events, followed by a section on Italian embroidery techniques with lots of colour photos of pieces in Vima's own incredible collection and also photos of pieces from the private collections that she has seen over the years; next there is a history of lace and again a section which follows detailing the many needle and pillow laces of Italy; tassels have their own chapter as do weaving techniques and traditional costumes, each chapter is sprinkled with little stories of Vima's experiences and tales of some of the people she has known relating to the individual techniques; after all this is a calendar of some of the regular events held in Italy where you can see fine embroideries and laces; a chapter on good museums and shops in the various regions of Italy which have a particular richness in Italian needlework and where Vima has personally seen the items. 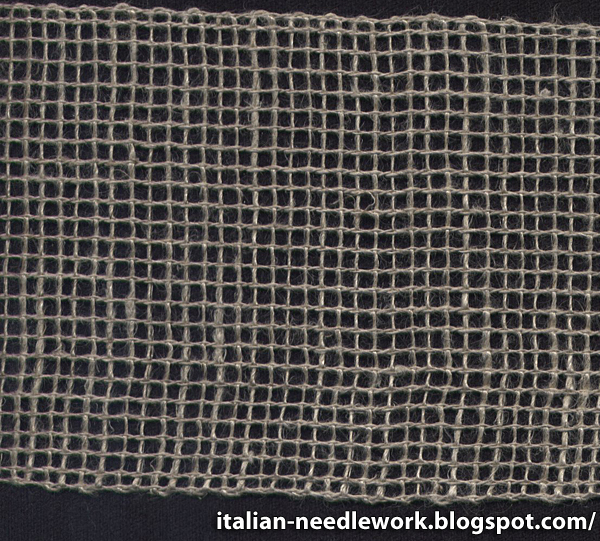 At the end of the book is an indispensible vocabulary of needlework and textile terminology in both Italian and English; a glossary and bibliographies of both Italian and English publications. Vima tirelessly helps out in the assembly of the Italian needlework exhibit at the EGA National Seminar in San Francisco, September, 2010. In the introduction, Vima states that she has tried to include the information which she has been most often asked by the public throughout her years of travelling and teaching. You can see that she has put a lot of thought and care into what she has presented. Honestly it has satisfied my curiosity about the things she has done and seen and I must compliment her on this volume as it is not often that one is able to provide exactly what is asked for. Italian needlework enthusiasts are sure be very pleased with this book. 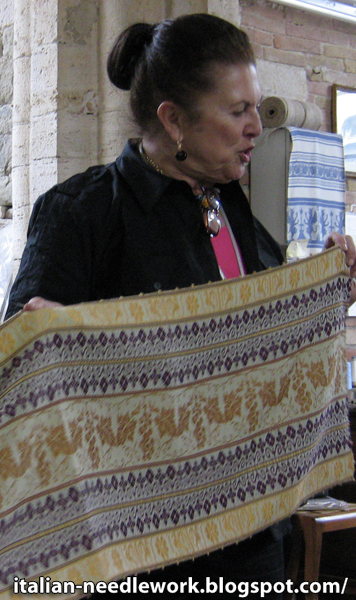 Vima explains Perugian weaving techniques in Perugia, May, 2009. 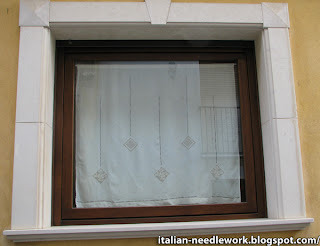 You can purchase Italian Needlework Treasures directly from Vima on her website. If you'd like to learn a little more about her, go to Tuttoricamo, click on the British flag for the English pages and then click on "Prominent Characters", then her name under the "...today" heading. In the small comune of Ulassai in the south-east part of Sardinia among the mountains and cliffs there is a small hand-weaving workshop called Su Marmuri next to the Stazione d'Arte Museum which features many of the art works of a Sardinian artist named Maria Lai (you can see some of her art in this YouTube video). and their signage! These little goats show up in many things. 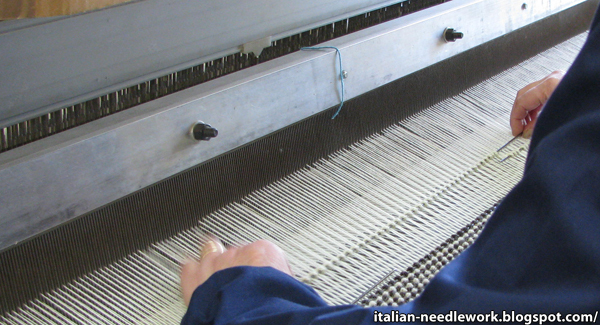 The rods are not the whole width of the weaving so many must be used together, it is a painstaking and time-consuming method but the results are very attractive! I got a couple of hand-towels with Maria Lai's goats on them and a peacock patterned one which can be seen here. After the visit to the museum and the hand-weaving studio, we visited Maria Lai herself but I'll save that story for another day. I have always been a fan of Giuliana Buonpadre's embroidery and her books. She makes elegant things which are always tastefully done and her creativity inspires me. 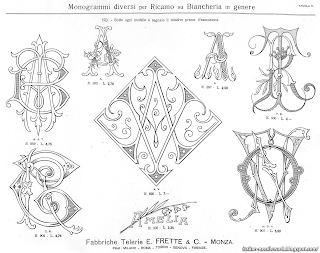 I told you a little about one of her books in this post on Reticello. I tried to visit her at her little shop in Via S. Egidio in Verona in 2007 but alas, she had broken her leg and the shop was closed. I was pleasantly surprised later that same trip to meet her and her lovely husband at the Italia Invita Forum in Rimini. In 2009 concern for her health was widespread as she had a bout of cancer as I understand it but thankfully she recovered and is once again teaching, traveling and writing. In the little shop in Verona now there is the association "Le Amiche di FiloFilò" or "the friends of FiloFilò", FiloFilò is the name of Giuliana Buonpadre's original association. Classes are available. 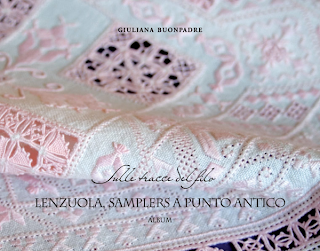 This year Signora Buonpadre released a new book, starting a new series called "Sulle tracce del filo" [Following the tracks of the thread], the first of this series is titled: Lenzuola, Samplers a Punto Antico [Sheets, Samplers in Antique Stitch]. These are books of great instructional value as they are produced for the most part in three languages: Italian, French and English. They include clear photographs and professional images and stitch diagrams. The best thing I like about them is that they show a stitched sample beside the pattern diagram so you can see what the stitch or motif will look like when completed. This particular book is more advanced in the level of expertise needed to stitch the designs, that is, it goes beyond the basics and the projects are more labour intensive and time consuming than some of her previous books. 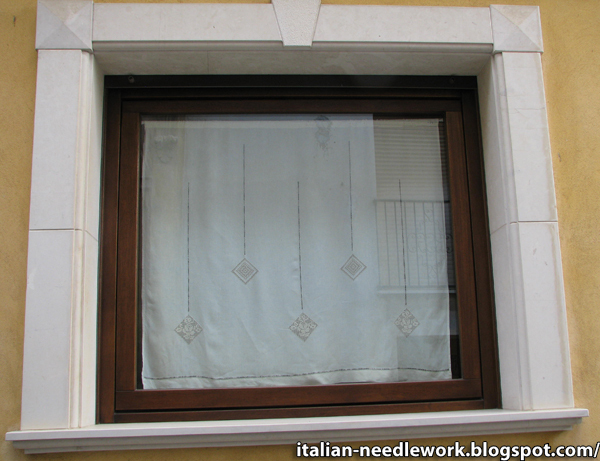 The combination of Punto Antico and Reticello motifs is very pleasing to the eye. 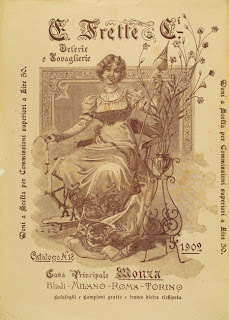 There are instructions for cutting, finishing and hemming sheets and various styles of pillowcases, a stitch glossary and instructions for classic embroidery, pulled thread and needle lace stitches, corner treatments and a lovely introduction in which Signora Buonpadre describes the path she followed which led to this latest publication. If you join her website, you can download sample pages of her books, though there aren't any examples of this particular volume, the samples of previous book's pages will give you a good idea of the format of this one. You can also purchase directly by filling out the request page on her website. Chiaramonte Gulfi was known as the balcony of Sicily in the previous century for it's panoramic position: it rests atop a hillside at nearly 700 metres above sea level and looks out over the Ippari Valley. On a clear day you can see the Mediterranean Sea in one direction and Mount Etna in the other in a breathtaking view you can take in from the Villa Comunale. We started out from our hotel in Comiso which is relatively nearby, taking the only bus which turned out to be the school bus that stopped at all the surrounding towns before taking the students to Chiaramonte Gulfi. What initially seemed a short journey was really a very long and winding road on a bus full of enthusiastic and boisterous students! You live and you learn and since we were in an adventurous mood we took it in stride and climbed the steep road to Chiaramonte Gulfi from the bus stop at the foot of town happy to have arrived at last. In a bar where we had fantastic pastries we learned where to go to get tickets for the Sicilian Drawnthread Museum [Museo dello Sfilato], impressed that all the men we asked knew all about it. At the Museo dei Cimeli Storico Militari [Museum of Historic Military Relics] in the main Piazza Duomo (which is where you need to buy your ticket to the museum) we met a lovely lady who offered to accompany us to the Drawnthread Museum. 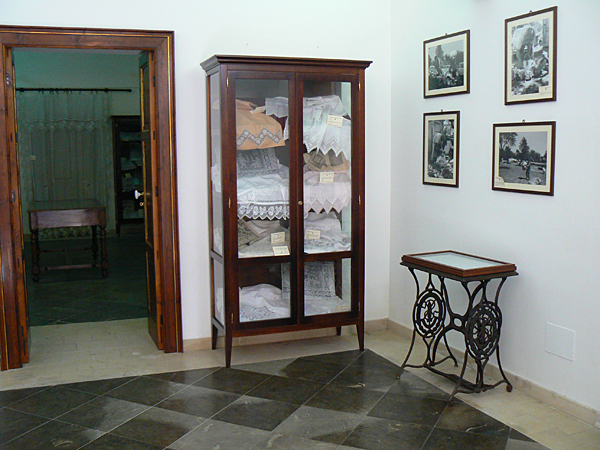 The museum itself seems small but is packed solid with needlework and definitely worth the trip. Entrance Hall of the Museo dello Sfilato, Chiaramonte Gulfi. We spent a lovely morning drooling over all the clothing, table linens, household furnishings and other exquisitely embroidered items in the museum and our guide told us as much as she could about the museum and the works within. 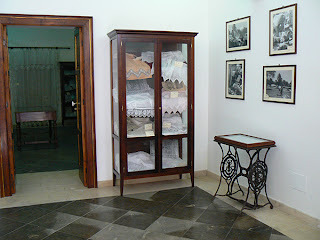 She was a member of the Associazione dell'Arte del Ricamo e dello Sfilato a Chiaramonte Gulfi [Association of the Art of Embroidery and Drawnthread of Chiaramonte Gulfi] so her love of the embroidered pieces shone through when she was telling us about them. 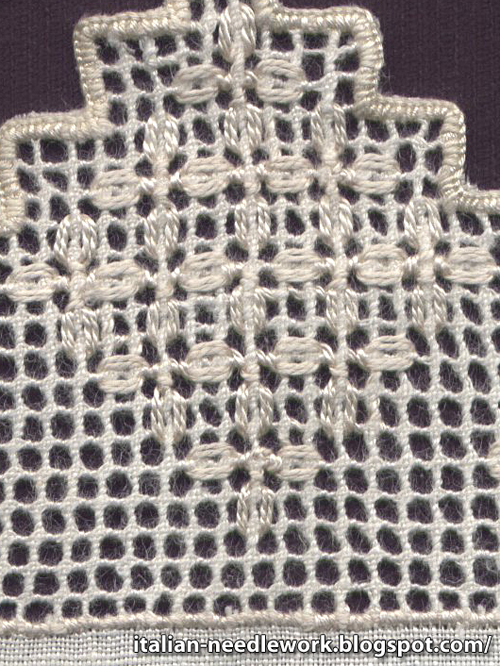 Close up of the Chiaramonte Stitch. 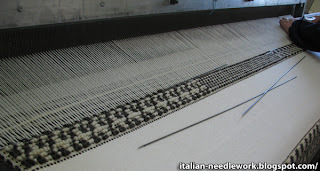 There is a great tutorial of this stitch on Tuttoricamo, click on the British flag for the English pages, then click on "How it's Done" and then "Chiaramonte Stitch". We hired a driver from the travel agency in the Piazza Duomo to take us back to Comiso so we could be back in time for our lessons with Roberta Rizza in the afternoon. Special thanks to Elisabetta for the use of her photos! Records of her possessions after her death suggest that the Florentine Queen of France Catherine de Medici herself embroidered on Buratto perhaps bringing it with her from Italy (for more info see my article in Piecework Nov/Dec 2010). Until quite recently this fabric was only made in a small town in Tuscany using the special ancient loom required to weave it. The art of embroidery on Buratto had all but died out. On a recent visit to the Fondazione Lisio, I was pleasantly surprized to discover that they had plans to acquire one of these very rare specialized looms and begin to weave Buratto fabric in the ancient style. 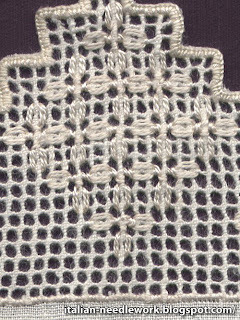 Among the reproductions of ancient weaving techniques that the Lisio Foundation boasts in its long history, there is now a new one: Buratto netting. The term derives from the Latin bura (coarse cloth) and indicates a fabric produced on a loom and consisting of a more or less open weave depending on its intended use as either a sieve used in silk or flour production or, if made ​​with finer threads, as the base for hand embroidery. 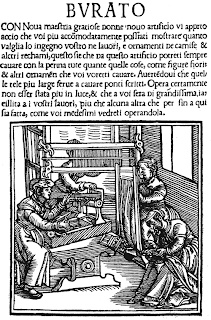 Evidence of embroidered Buratto dates back to the sixteenth century and to 1527 and the oldest Italian extant book of patterns: The burato: book of embroidery by Alessandro Paganini (ed. Venice, Paganini). 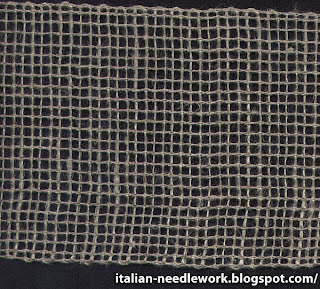 This ancient textile technique of both weaving and embroidery, was revived at the beginning of the twentieth century by the ladies Virginia Nathan and Clara Onori of Antella (a hamlet of Bagno a Ripoli near Florence), founding a school with the aim of providing a source of livelihood which would help relieve the domestic economy of the area. Today at the Foundation alongside the Jacquard looms on which our master weavers create fine velvets and brocades, there is a loom, just as important as the others, on which Buratto netting is hand woven thus continuing a local tradition that was almost lost." 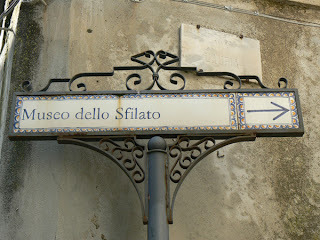 Photo copyright Fondazione Lisio Arte della Seta, Firenze. You can watch a video of how it's made on YouTube. In 1989, there was a booklet produced to document the recent history of the revival of Buratto embroidery in the early 20th century and the activity it enjoyed throughout the later half of the century called: La Tradizione del Buratto all'Antella [The Tradition of Buratto in Antella]. This book is extremely rare and difficult to find but packed with photos of embroideries of the period including some which were prize winning entries in local exhibitions. It is also a catalogue of the show held in Antella at the time. It is the most information I've ever seen written on Buratto and it's related history. 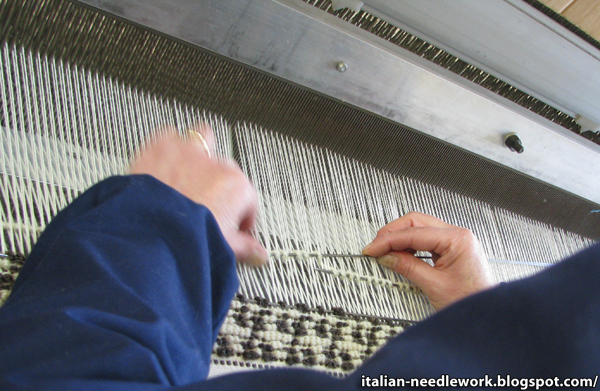 Here is a close up of what a piece I have looks like, this was purchased from the Fil-Mec booth at the Italia Invita Forum 2011 and to the best of my knowledge was not woven at the Fondazione Lisio but by a woman in Tuscany working on her own ancient loom. Heartfelt thanks to Ebe Ciampalini Balestri without whom I would never have seen the book described above. Thank you Giovanna for the heads up! See the girl is spinning thread and there are Flax flowers growing out of the pot beside her. It reminded me that I had had some requests for more scans from my Frette catalogue which I wrote about in a post last year. Now, keep in mind that the catalogue is enormous! It's probably A3 paper size or something close to it so of course it doesn't fit in my scanner. Each page must be scanned in three pieces and then I have to put them back together in Photoshop. This is largely why I haven't done anything yet but I thought this morning while everyone else was still asleep I'd see just how long it took me to do one page. Well, it took a lot longer than I expected but now that I've established a series of steps, it might take less time to do more. In the interests of conserving storage space for the files on Blogger, I started a Flickr set and will link from there. I can't make any promises about when I'll get the whole thing done, but check back every once in a while to see if I've added any more scans. Check out the Antique Pattern Library for a different Frette album which has charts and patterns for alphabets, borders and more.